When Cameron and Eleanor Sexton arrive home to find their teenage babysitter missing, their immediate concern is for their young daughter. Detective Sergeant Jessica Daniel is dispatched to find out what's going on, but with all apparently well, she thinks she's been sent on a fool's errand. Soon, the teenager's body is discovered in an apparently random house on the other side of Manchester. The puzzle deepens when a journalist points out that someone placed an obituary for him just days before his disappearance. A string of clues point to a club whose owner has an unhealthy interest in Jessica, but then something happens which makes her question the very core of her beliefs. In Thicker Than Water, Jessica is left to turn to the one person she knows she can rely on . . . but is that trust misplaced? Kerry Wilkinson is a bit less of an accidental author than he once was. His debut, Locked In, the first title in the detective Jessica Daniel series, was written as a challenge to himself but, after self-publishing, it became a UK Number One Kindle bestseller within three months of release. His three initial Jessica Daniel books sold over 250,000 copies in under six months, making him Amazon UK's top-selling author for the final quarter of 2011. 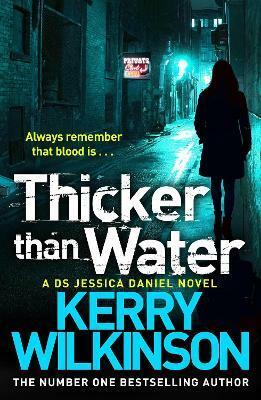 Thicker than Water is the sixth book in the series. Kerry has a degree in journalism and works for a national media company. He was born in Somerset but now lives in Lancashire.